How can I market my business without my employees or customers finding out? How are typical offers structured? Why aren’t all the financial documents of the business I am considering to buy available before I make an offer? How can I be certain a buyer will continue to pay me if I offer seller financing? QWhat Are The Advantages of Buying an Existing Business? QWhat Is My Business Worth? AThere are many elements that dictate the worth of a business – such as cash flow, equipment values, historic financial performance, lease terms, location, recurring revenue/repeat customers, competitors and the economy. Potential “strategic fit” and efficiencies of scale or eliminating redundancies also will come into play for strategic buyers. 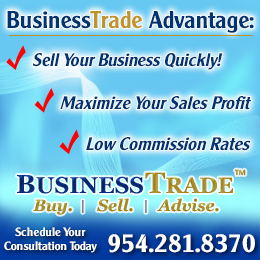 A BusinessTrade broker is capable of analyzing your business and comparing it with your competitors and recent transitions (“comps”) to reach the best price for your business. The documented evidence that we use to determine the value of your business will also assist in securing qualified buyers who are willing to pay the maximum price. At the end of the day though, it’s “worth” whatever the value of the best offer is. For this reason we’ll also advise you on how to set the asking price based on many factors. Our broker intermediaries will counsel you on all aspects of this. QWhy Should I List My Business For Sale With A Business Broker? QHow can I market my business without my employees or customers finding out? AAt BusinessTrade, we take great pride is our ability to keep all information confidential. At no time will the name of the company, owner or specific location be revealed. Any serious buyer is required to sign a confidentiality agreement to protect the seller’s interests, and will then be presented to you as the seller for your approval, before they will see the name or any other confidential information about your business. QWhat kind of financing is available? Banks will loan money on businesses that show a strong earnings history on the tax returns. They require a lot of documentations and the payment of upfront fees. In recent years, bank loans, which are guaranteed by the Small Business Administration, have become very popular and more readily available. QHow are typical offers structured? Although, Buyers may want to make a no-money or low-money down offer, it is very rare that they will succeed. Usually a business cannot earn enough to pay salary to the owner and service such a level of debt. In addition, the lender, whether it is the seller or a bank, wants the Buyer to show his commitment to the business by having vested financial interest in its success. QHow long does it take to sell a business? AIt generally takes, on average, between five to nine months to sell most businesses. Keep in mind that an average is just that. Some businesses will take longer to sell, while others will sell in a shorter period of time. It usually takes longer to sell a business than a house or a commercial building. Because of the confidential nature of a business sale, a business broker cannot put a For Sale sign on the window. QWhat can I do to help sell my business? AA buyer will want up-to-date financial information. If you use accountants, you can work with them on making current information available. If you are using an attorney, make sure they are familiar with the business closing process and the laws of your particular state. You might also ask if their schedule will allow them to participate in the closing on very short notice. If you and the buyer want to close the sale quickly, usually within a few weeks, unless there are healthcare, alcohol or other licenses involved that might delay things, you don’t want to wait until the attorney can make the time to prepare the documents or attend the closing. Time is of the essence in any business sale transaction. QWhat happens when there is a buyer for my business? AWhen a buyer is sufficiently interested in your business, he or she will, or should, submit an offer in writing. This offer or proposal may have one or more contingencies. Usually, the contingencies concern a detailed review of your financial records and may also include a review of your lease arrangements, franchise agreement (if there is one), or other pertinent details of the business. You may accept the terms of the offer or you may make a counter-proposal. You should understand, however, that if you do not accept the buyer’s proposal, the buyer can withdraw it at any time. At first review, you may not be pleased with a particular offer; however, it is important to look at it carefully. QWhy aren’t all the financial documents of the business I am considering to buy available before I make an offer? AJust as you would not want your personal financial documents made available to the public, business owners want only serious buyers to have access to such private information. Your Business Intermediary will provide you with summary information including gross sales, general expenses, lease information and cash flow. He/she will assist you in drafting an offer based on that information and protect you by making the offer contingent on your satisfaction with the seller’s business information upon your full investigation. An Offer to Purchase Agreement simply says, “If everything I assume about this business proves true, this is what I am willing to do.” You, the purchaser, then have the right to proceed, withdraw your offer or make a new offer based on your investigation. The seller, once he/she has accepted your offer, must stand by those terms unless you and you alone choose to alter them. QHow can I be certain a buyer will continue to pay me if I offer seller financing? AYou can’t ever be completely certain. But consider this: a Buyer isn’t likely to simply walk away from his deposit. In addition, we recommend that Sellers conduct their own due diligence on Buyers during the due diligence phase of a contract. This might include credit, IRS and reference checks. In addition, it’s normal to request a personal guarantee from the Buyer as part of the security agreement in the Note. QHow much do you charge for your services? AYou don’t pay anything if your business doesn’t sell. Our fee is a percentage of the sale, and is only paid once your business is sold. Thus, our interests are aligned with yours, meaning we do not get paid until you get paid. It’s also in our interest to sell your business for the highest price possible. We do not ask for any retainer fee. We are performance based.